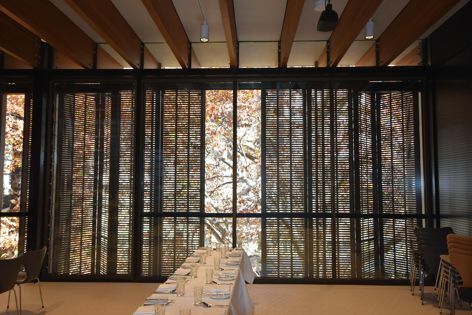 Providing heat and glare control without spoiling the view, ADI Motorized Bifold Screens form a seamless facade with no visible framing on the top, bottom or sides. Unlike manual bifold screens, ADI Motorized Bifold Screens can be operated from inside the building via the touch of a button. They are equipped with ADI anti-rattle technology, which ensures the screens do not rattle while opening or closing.